Holiday Gift Guide for Her — . It's the season of giving! 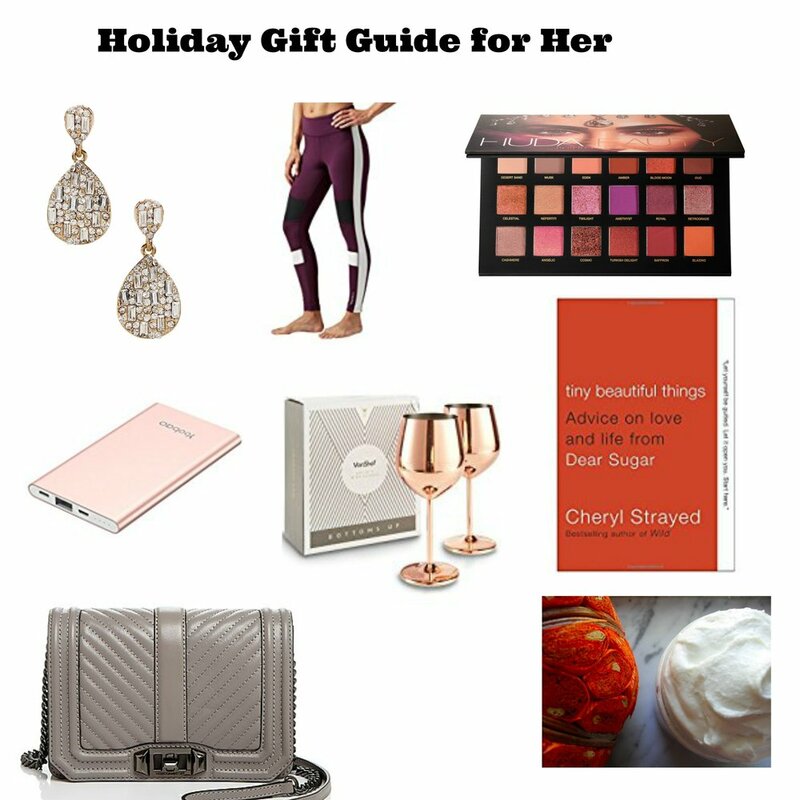 Enjoy my holiday gift guide for her, which features some of my personal favorite products. 1. Amrita Singh Statement Earrings - Statement earrings are the perfect accessory for the holiday season, and a lovely gift for your fashionista friend or family member. 2. Reebok Color Block workout leggings - A useful AND stylish gift for the fitness lover in your life. 3. Huda Beauty Desert Dusk Palette - This is currently one of my favorite eye shadow palettes. I love the vibrant pigmented colors. You'l find a great mix of matte and glitter colors to work with, and the beauty lover/makeup wearer in your life will love it. 4. Portable charger - This one is a no brainer, as it's a necessity for any modern woman on the go. 5. Copper Wine Glasses. The perfect gift for the wine lover in your life. 6. A great book like, Tiny Beautiful Things by Cheryl Strayed. This is one of my favorite books of all time and one that I reference often. The book is chock full of wisdom mixed with compassion. 7. Rebecca Minkoff Crossbody Bag. I love the chic versatility of a crossbody bag. Not only can you go hands-free with a crossbody bag, they are perfect for both day and night. I have been eyeing this Rebecca Minkoff one for awhile, and it's a great gift to give. 8. Belle Butters Body Butter. I have been a Belle Butter customer for years now, and I LOVE the body butters. They are very moisturizing especially in the winter months when skin tends to get dry.